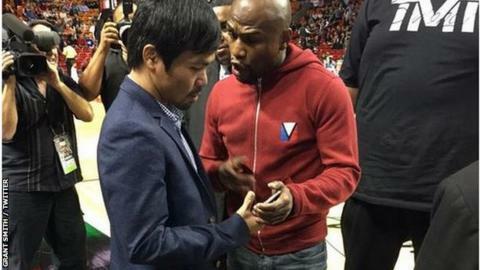 Manny Pacquiao and Floyd Mayweather exchanged phone numbers at a US basketball game as they met in person for the first time. A long-awaited welterweight fight between the two has long been talked about, but a deal has yet to be agreed. Filipino Pacquiao, 36, is the WBO belt holder, while American Mayweather, 37, is the WBC and WBA champion. "He gave his number to me and said we will communicate with each other," Pacquiao said at the Miami Heat game. Pacquiao, an eight-division world champion, and Mayweather, who has been world champion at five weights, are considered the best fighters of their generation. The fighters were both sitting courtside as Miami took on Milwaukee Bucks on Tuesday night. The stadium put photos of both fighters on their video screens during a first-half stoppage in play, with the caption "Coming in 2015?" Pacquiao's publicist Fred Sternburg recently said a bout between the two still has "a long way to go" but that there has been movement "in a positive direction". It followed reports Pacquiao had agreed terms on a 2 May bout in Las Vegas. One stumbling block has been Mayweather's insistence on a strict blood-testing programme during training, but Pacquiao said those demands cast him in a bad light as a suspected cheat.